Jalen dribbles through the legs of Carlos Gomez. (Monroe CT) Sometimes a tourney MVP award takes some figuring. Not so in the 2010 Masuk Holiday Tournament. Jalen Graham was clearly the best player on the floor as Masuk (5-0) defeated Norwalk (1-4), 47-38, in the championship game of the Masuk Holiday Tournament on Thursday afternoon at Masuk High School. The 5-11 senior tallied twenty-one points but those numbers only begin to tell the story of his value to the still undefeated Panthers in this game. I saw steals, blocked shots, and his being the primary ball-handler versus full court pressure as added plusses. Anthony DeLorenzo (5 points) puts up a second half free throw for Masuk. Both teams had played, and won, yesterday so you knew going in that things would get ragged…….and they did. The shooting seemed most effected. The teams combined for a pathetic 6-for-34 from long range. That 17% for those of you without calculators! The poor shooting kept any sort of sustained offense to a minimum. In fact in this game there was only one major run and that was a 12-point run by Masuk in the first four minutes of the 3rd quarter. Jalen (the MVP) was all over that game-changing run. Let’s unwrap that run. 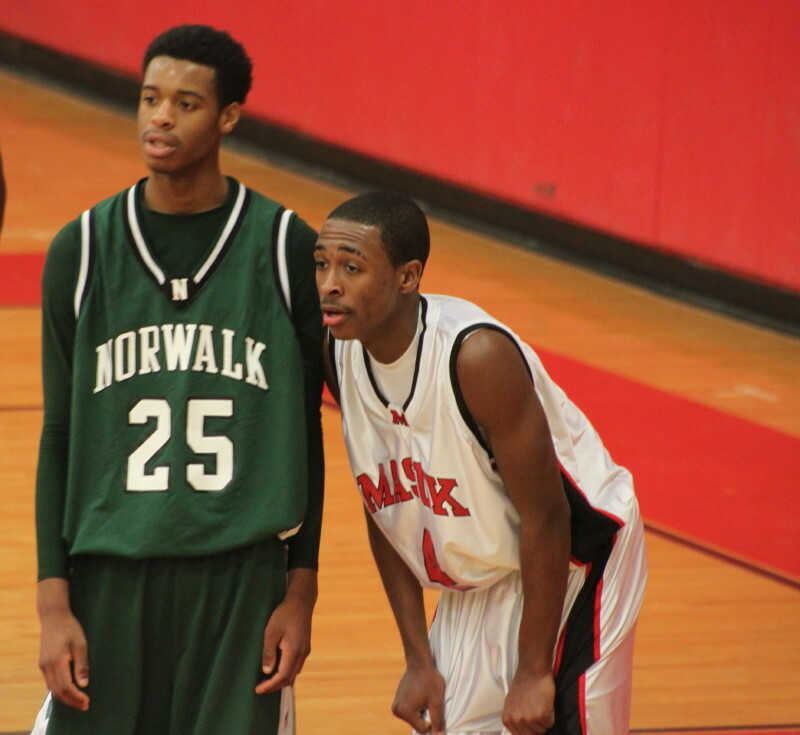 Jabari Dear opened the 3rd quarter with a layup for Norwalk to make the score Masuk 21, Norwalk 18. Then came Jalen: assist on a Glenn Taylor layup, layup on his own, assist on another Glenn Taylor layup, layup on his own after making a steal, layup by Nick Davies, a layup on his own. There’re your twelve unanswered points as Norwalk had four turnovers and five missed shots while this happened. This super stretch gave the Panthers a 33-18 lead midway through the third quarter. The Bears couldn’t generate enough sustained offense to get all the way back. They did close to 43-38 with 1 ½ minutes left but didn’t score again after that. Norwalk started slow (down 8-3) but went on a 9-1 stretch to gain a 14-11 lead early in the second period. Then the MVP sparked a 6-point run with a layup and an assist on Matthew Gerak’s layup. 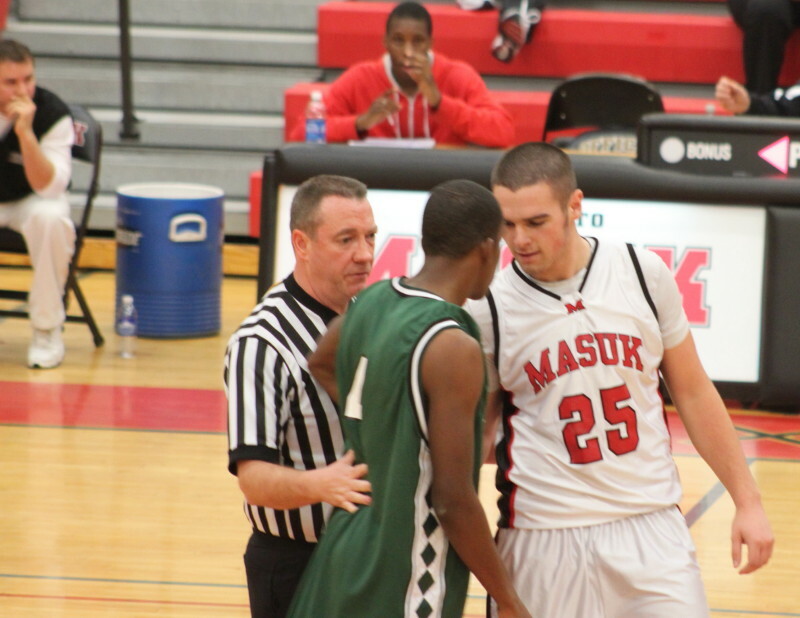 This gave Masuk the lead (17-16) and they never trailed again. Another MVP moment came after Masuk suffered a major scoring drought late in the 3rd quarter into the 4th. How bad was the drought? 6 ½ minutes long. Nine missed shots and five turnovers. Norwalk managed to put together seven points during the same segment to narrow things to 38-30 with 5:15 left. Who would step up to stop the run? You guessed it. This time it was a drive that had Jalen slice through, by my count, three Bear defenders. 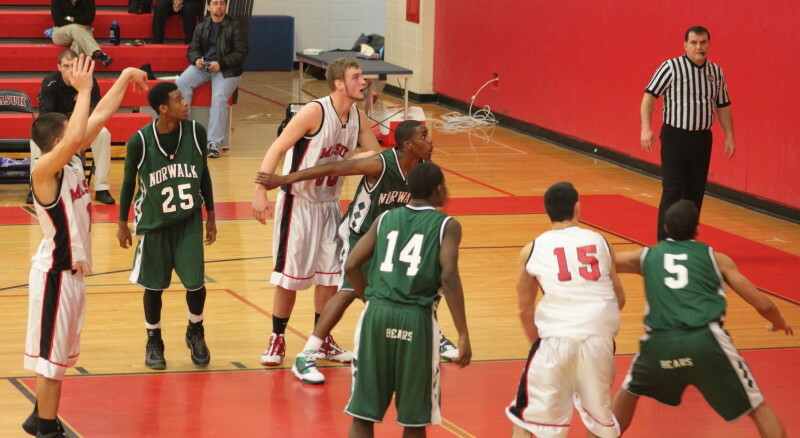 The Masuk defense kept Norwalk on the perimeter most of the time. A jump shooting team with tired legs is never good. 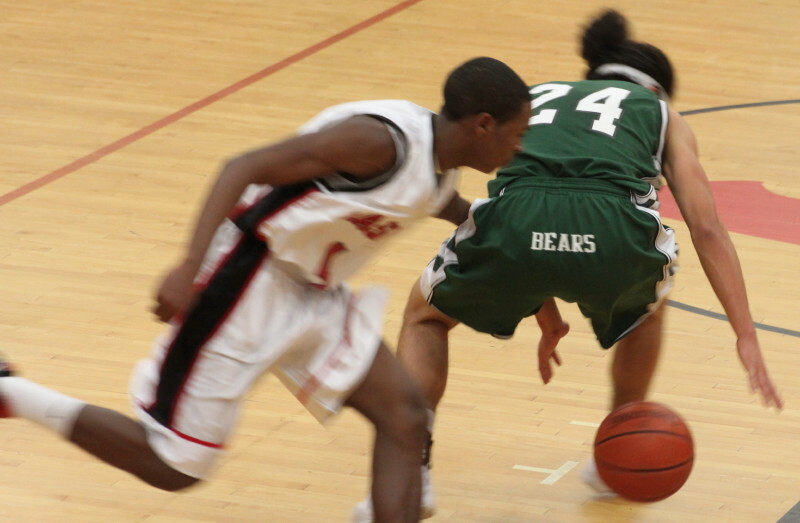 Delshaun Wilson (14) hit a couple of long shots and led the Bear scorers. 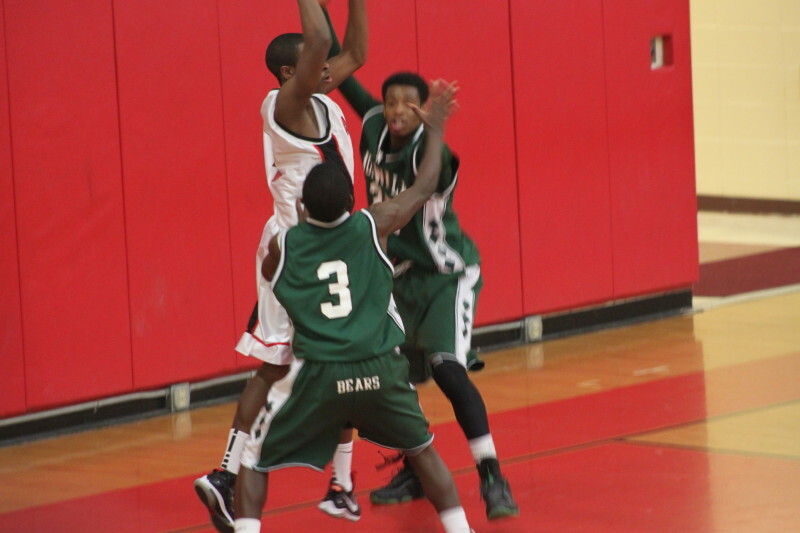 Glenn Taylor added 10 points for Masuk getting himself on the scoring end of some of Jalen’s passes. Referee cools off two players. One of the two referees had nearly everyone’s attention by the time the game was over. I highly approved of his performance. I should have guessed his style by the military crew cut. Anyhow, he first took on a group of Masuk students who had obviously offered him some “suggestions.” He confronted the students and told them emphatically to stop. They did. Later a couple of players were getting more physical then they should and instead of whistling fouls he brought them together. They were to shake hands or face the alternative. They shook hands. 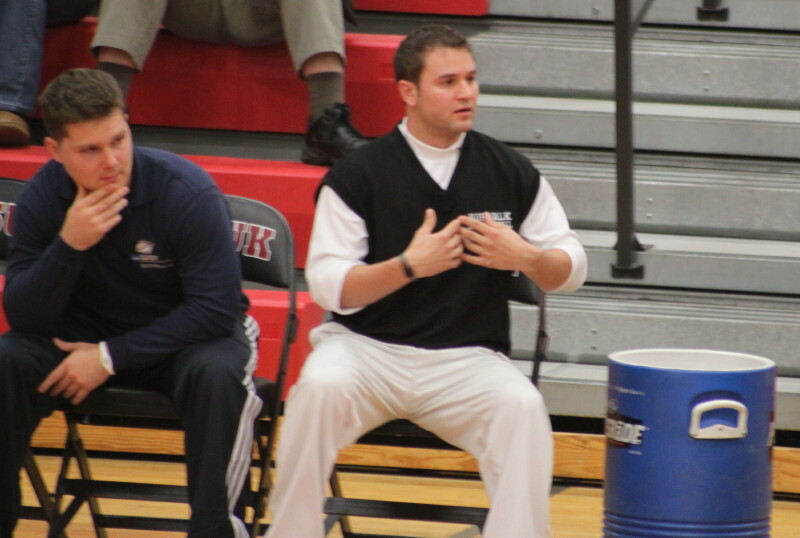 Coach Bobby Trimboli seeks an explanation. across the court and again told the coach to sit down. Coach Trimboli did sit down probably thinking that the referee would come over and give some sort of explanation if he did. He didn’t. I was trying to imagine Bobby Knight in the same situation! I came away very impressed with Jalen Graham. His ability to handle the ball, defend, and get to the basket were eye-catching. He looked, to me, to be a player who could hold his own at the next level.